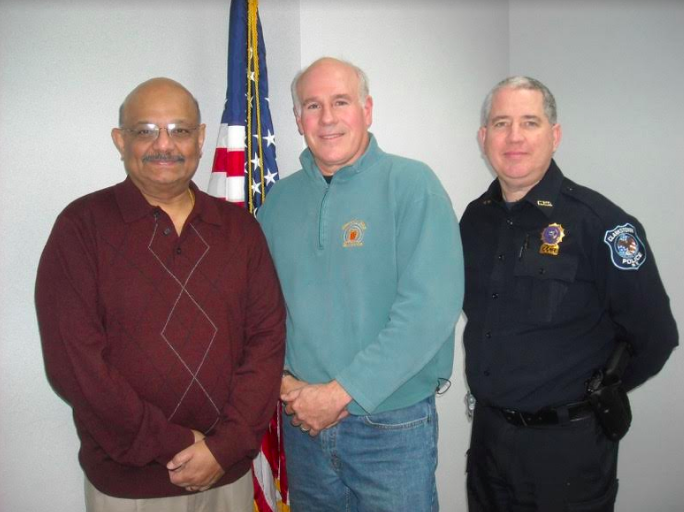 Pictured L to R are Clarkstown Auxiliary Captain Darryl Draper; Clarkstown Police Department Lieutenant Steve Morgan, Liaison to the Auxiliary Police and Clarkstown Police Department Information Officer Detective Peter Walker. Clarkstown Auxiliary police officers are community-concerned men and women from diverse backgrounds and occupations who volunteer to assist the police department by performing uniformed foot and vehicle patrols. They’re trained to provide the ‘eyes and ears’ of the police department by observing and reporting conditions requiring the services of regular police. “Once a year, we have an annual awards dinner, which is a great event for us,” Draper said. “We recognize members of the department for their service based on the numbers of hours. We have a lot of members who have served for more than 25 years. During the summer, we have a picnic and during the winter, we have a holiday party. We have a wonderful relationship with CPD that includes a lot of good communication and camaraderie,” said Captain Draper. For additional information about the Clarkstown Auxiliary Police or to volunteer, conact Captain Draper at 845-639-5887.